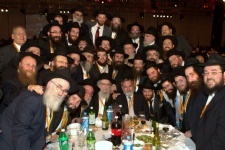 Thousands of rabbinical scholars, Jewish community leaders, educators and counselors from around the world filled the landmark Brooklyn Cruise Terminal on Sunday night for the gala banquet of the 28th annual International Conference of Chabad-Lubavitch Emissaries. 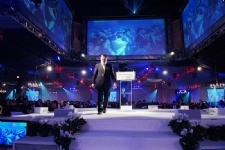 Joining tens of thousands more who watched the proceedings online, the crowd of emissaries and their lay leaders, representing thousands of locations in communities large and small, gave British Chief Rabbi Lord Jonathan Sacks a standing ovation as he ascended a rotating stage to address the gathering. Lord Sacks delivered a powerful and inspirational talk as he addressed the Conference. The banquet concluded a weekend of educational workshops, programmes and lectures which were aimed at developing different approaches and igniting discussions and comparisons between emissaries and the communities that they represent. 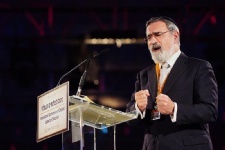 Lord Sacks spoke movingly about his own connection to Chabad which began when he met the Rebbe - Rabbi Menachem M Schneerson of righteous memory - over 40 years ago. He claimed to be humbled in the presence of the crowd and said that Chabad Shluchim are 'amongst the most important people in the Jewish world today'. He relayed the story of how he had planned to be an economist, a lawyer or an academic until the Rebbe advised him to become a Rabbi. He said, ‘42 years ago one of the great Jewish leaders of all time took an unknown student from thousands of miles away and lit a light in his soul that has burnt from that day to this, and he did this not just for him, but for tens of thousands of others, and we are his Shluchim’. Towards the end of his speech he returned to the theme of light and specifically of Chanukah. He said, ‘When we go out to Jews who are less committed than we are, our light is not diminished; the result is that we create more light in the world. Together let us light a flame in the hearts of other Jews, and together, let us light up the world’. After the speech Lord Sacks joined the post-Banquet Farbrengen where he sang and danced with the Shluchim. With thanks to Karen Schwartz for contributing to this article.